As geckos move through water they slap their arms, generating air bubbles that help them stay afloat. Geckos have a multitude of methods for moving around. They can run across rugged terrain, swim swiftly under water, and even swing their tails to perform acrobatic maneuvers in the air. Now, a new study from Jasmine Nirody, a Rockefeller fellow in physics and biology, reveals that these animals can also scurry across the water’s surface at impressive speeds. The study, published in Current Biology, outlines a combination of techniques that geckos use to accomplish this feat. If you’re an animal in a hurry, swimming is not an ideal mode of transportation. 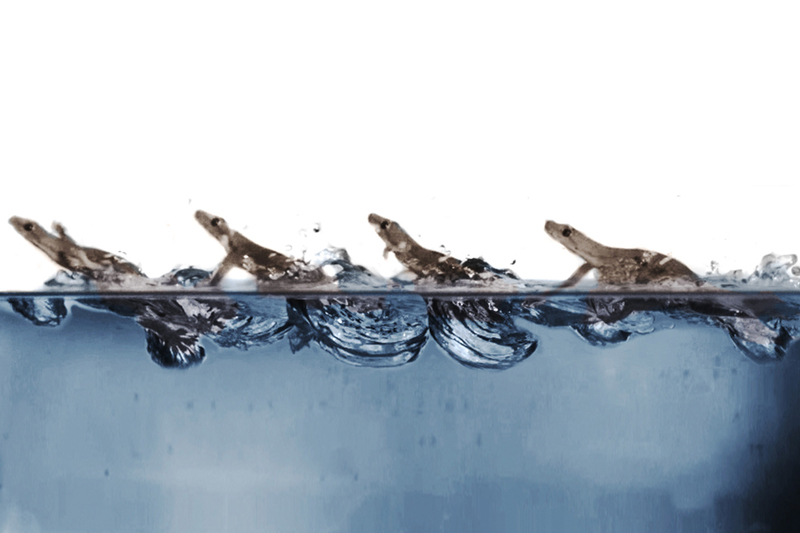 As a rule, bodies move through water much slower than they move through air. Some animals, however, have evolved techniques to keep most of their body above the water’s surface as they traverse ponds and puddles. Effectively walking on water, these animals can move faster than simple swimmers. This kind of behavior has been observed in very small organisms, such as spiders, and larger ones like the basilisk lizard. Whereas the former relies on water’s surface tension to stay dry, the latter uses its size and strength to elevate itself above the water as it moves. Surface scampering among mid-sized animals like geckos, however, was not known to occur—that is, until Adrian Jusufi, one of Nirody’s colleagues at the University of California at Berkeley, spotted a galloping gecko while on a research trip in Singapore. Using a high-speed camera, Jusufi recorded the little lizard darting between trees in a flooded area. Back at Berkeley, he showed the movie to his co-workers. “We were all blown away,” Nirody says. The researchers’ surprise derived, in part, from the size of the animal. Too large to depend on surface tension alone, and too small to heave itself up by sheer force, a gecko, they thought, shouldn’t be capable of this kind of maneuver. Intrigued, Nirody and her colleagues acquired some geckos and a tank, and set out to reproduce the animals’ unlikely behavior in the lab. In recording and quantifying the animals’ movement, the researchers revealed that, like basilisks, geckos use a slapping motion to hoist their bodies above water. “When they hit the water they actually create an air bubble, which generates extra force and helps their body stay above the surface,” says Nirody. Still, whereas basilisks can support the entirety of their body weight with water slapping, geckos can support only about a quarter of their weight using this technique. Realizing that geckos must employ complementary strategies to stay afloat, the researchers considered the secret weapon exploited by animals on the other end of the size spectrum: surface tension. “We put the geckos in soapy water, which has lower surface tension,” says Nirody. Sure enough, the animals could no longer support themselves, suggesting that surface tension was helping them stay above water. Yet, after performing some calculations, the researchers still couldn’t fully account for the gecko’s impressive elevation—leading them to discover one more feature that contributes to the animal’s aquatic agility. Beyond illuminating the impressive nimbleness of geckos, this research, says Nirody, could be used to develop robots that mimic the animal’s behavior.